Think of your favourite holiday resort. Chances are it’s close to the sea, a lake or river. People find ocean waves, waterfalls or trickling streams both fascinating and relaxing. One theory about why we are drawn to water is that it triggers a genetic memory of our natural environment. Whatever the reason, it’s a proven fact that running water generates negative ions that purify the surrounding air making it feel fresher and boosting our sense of well-being. Any source of water in your garden will quickly attract insects, birds and wild animals. A good variety of wildlife leads to a healthy, balanced eco-system where creatures that most gardeners regard as pests are naturally kept to manageable levels. For example, if you’re lucky enough to have frogs, toads or hedgehogs you’ll have very few slugs. A rectangular or circular pool makes an attractive centrepiece in a formal garden while water flowing over a stainless steel sculpture can be the perfect finishing touch to a modern, architectural garden. Think of the overall effect you want to create and choose a water feature to enhance it. You can use a small, gently bubbling fountain to create a tranquil haven where you can relax away from the stresses of everyday life. Or, if you love entertaining on summer evenings, impress your guests with exuberant fountains complete with coloured lights. A large garden could accommodate several ponds, perhaps on different levels and connected with cascades. If you only have a small courtyard you can still choose from a huge range of wall-mounted or freestanding water features. If you’re a gardener who enjoys the challenge of growing something different, a pond allows you to discover the wonderful world of water plants. Look at all the options when designing a water feature and deciding where to place it. A pond under trees will need to be frequently cleared of fallen leaves. A wildlife pond should have sloping edges that allow easy access for small creatures. If an electric pump is needed where will the cable go? Even a small pond requires a surprising amount of work. It’s not just a case of digging a hole and filling it with water! If you want it to look good and last a long time it needs to be constructed properly so, even if you plan to do some or all of the work yourself, it’s worth asking for a free, no obligation consultation from a professional landscape gardener who is experienced in adding water features to gardens. And, for your own safety, you must use a qualified electrician to install any mains operated pumps, filters or lights. Want to add vitality to your garden? Just add water! 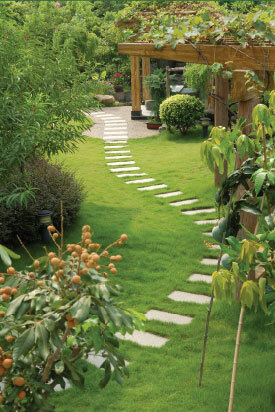 Hire a professional landscape gardener to advise you on the best type of feature to suit your garden.